Dhuoda's Liber manualis (Manual/Handbook) is a unique work by a female author from the 9th century. Fragments of a Carolingian era manuscript exist in a library in Nîmes, and a single 17th century copy of the original exists in the Biliothèque Nationale in Paris. Even if, more and more, you acquire books, many volumes, may it still please you to read frequently this little work of mine—may you have the strength to grasp it profitably, with the help of almighty God. [...] So it is altogether necessary for you, my son William, to show yourself, in both ventures, as one who can be of service to the world and at the same time can always, through every action, give delight to God. My son, you will have teachers who will give you more lessons, and more valuable ones—yet not in the same way, with the heart burning within, as I with mine, my first-born one... . Emphasis on her special role as his mother in teaching him is mentioned throughout the work. She also asks that he pass the book along to his younger brother, recently born and taken into his father's care almost immediately. It is an amazing work, written by a woman who devoted herself to duty to her husband and to her sons, even though she spent most of her life without their presence. *Some quotations from Women Writers of the Middle Ages by Peter Dronke. Bernard of Septimania, whose fate interweaves the recent posts on Carolingian civil wars, married Dhuoda on 24 June 824. She bore him two sons: William on 29 November 826, and Bernard II on 22 March 841. Although she traveled with her husband for a few years, she spent most of the years between births in Uzés in what is now southern France. What little we know about her comes from details in the Liber Manualis (Book of instruction) which she wrote for her elder son. There are, however, assumptions we can make that are fairly safe and will serve to flesh out her background. For one thing, it is likely that she came from a noble family, and that she and Bernard met through court connections. It was probably not simply a marriage of political convenience, since he not only bothered to have her with him for at least a few years, but also trusted her to run his estates from Uzés near Nîmes and visited her when he could—certainly in summer of 840, around the time of the death of Emperor Louis the Pious, just before Bernard ran off and got involved (disastrously for him) in the chaos fomented by Louis' remaining sons. She would have seen her elder son very little, and her second son was taken from her by her husband before he was baptized or named. This separation, and concern for the shifting politics and her husband's risky involvement, may be what prompted her to write to William, to help him to steer clear of personal and professional dangers. She gives him practical advice for living, not just spiritual advice for the care of his soul. We also know that Dhuoda learned Latin. This is not unusual, especially considering the emphasis Charlemagne put on education for all children. True, her Latin is far from polished, but she clearly knows the Bible as well as secular authors, and she manages to come across with both humor and gravity in 73 chapters. Her writing provides a unique glimpse into attitudes toward family structures. Unlike the Mirrors for Princes, her manual is highly specific: it focuses on her as a wife and mother caring and advising her son and only her son; she never suggests that this is a general purpose guide for anyone else. According to the Catholic Encyclopedia, "it is a treatise on Christian virtues, revealing the author's remarkable qualities of heart and mind, her intense affection for her sons and her husband." You will be able to discover fully what rules you must fulfill for my sake. My son, you will have teachers who instruct you in many more useful lessons than I do but they do not have equal status with me or have hearts burning in their breasts as I, your mother, do, my firstborn child. She tells us in the Liber that it was started 30 November 841 and finished 2 February 843. She speaks of herself as being weak and near death, and the Catholic Encyclopedia suggests that her death, probably shortly after completing the manuscript, spared her the news of her husband's execution by Charles the Bald in 844. Tomorrow we shall look at some of her advice from the Liber. Back here I mentioned that Bernard of Septimania married a woman named Dhuoda, whom he had travel with him for awhile; then he sent her to live at Uzés in what is now southern France. As is the case with many political figures involved in military or court jobs, he rarely spent time with her after that. This is not to say that he no longer cared for her; just that his job came first. The circumstantial evidence is that he wanted her there for her safety: he became involved in every civil strife caused by the sons of Louis the Pious. When not involved directly at Court (that is, when he was exiled), there is evidence that he returned to the south to see her. It is certain that he fathered a second son on one of these visits. Dhuoda wrote a book of advice for her elder son; there is, however, no evidence that he ever read or even received it. In fact, it seems highly unlikely, if he did read it, that he took any of it to heart. William of Septimania (29 November 826-850), was first raised by his uncle, Theodoric of Autun, until Theodoric's death when William was four; then he was sent to the court of Louis the Pious, where his father was chamberlain. William stayed with Louis throughout the emperor's life, although he seems to have traveled to Toulouse with his father at times, and also spent time at Uzés with his mother. After Louis' death in 840, Bernard used his son as a go-between, sending him to pledge loyalty to Charles the Bald. William stayed with Charles, asking for (and eventually receiving) Theodoric's lands in Autun. When Bernard was executed in 844 by Charles, William joined Pepin II in his attempt to keep control of Aquitaine (Louis had given it to Charles, but the Aquitaine nobles had preferred Pepin). Pepin offered him his father's territory of Toulouse, although Charles had given it to Fredelo (who was actually a cousin of William's: William of Gellone was grandfather to both men). William was present in Toulouse and was able to defend it, but in 849 he went to Barcelona to take control of an area his father had once ruled, leaving Toulouse unguarded for Charles to take over; Charles confirmed Fredelo in possession of Toulouse. William made no friends in Barcelona—having taken it, it was said, "more by cunning and lies than by force of arms"—and in 850 when he fled back there to escape the wrath of Charles after a later military defeat, Charles' supporters killed him. Clearly, his political choices and personal behavior were no more commendable than his father's. Would he have made different choices if he had read his mother's book of advice? Let's look at what was in it and see what we think. Charlemagne's grandsons were not satisfied with the way their father, Emperor Louis the Pious, divided up his realm while still alive so they could have territories to rule. They frequently rebelled against him and each other in order to grab more. On these occasions, a sometime adviser to Louis, Bernard of Septimania, once chose the losing side, once chose the winning side, and then tried a different approach. In 837, Louis the Pious was becoming more devoted to Charles the Bald, his son by his second wife. He made Charles king of Alemannia and Burgundy, including a portion of the land that had been given to Louis the German, Louis' youngest son by his first wife. Louis the German (understandably) objected, invaded Alemannia (for the second time: he had invaded Alemannia as his part of the 2nd civil war). In 838, Pepin died, and Charles was named King of Aquitaine. Unfortunately, the nobles of Aquitaine decided to name Pepin's son, Pepin II, their new king. Lothair actually sided with his father this time; their combined forces quickly deposed Pepin II, forced Louis the German to retreat quickly (but gave him Bavaria), and then granted the whole eastern part of the Empire to Lothair, including Italy. This was merely a prequel to the free-for-all in 840, when Louis the Pious died. Pepin was gone, but there were still three (half-) brothers capable of alliance or discord, whichever suited their goals. * Louis the German, with little land, allied himself with the now-more-powerful ruler of the western half of the empire, Charles, and they attacked Lothair. While they marched their armies eastward, Pepin II reared his head again and claimed kingship of the now-deserted Aquitaine, offering his support to Lothair. A decisive battle was fought in June 841, in which Charles and Louis forced Lothair to flee. But where was Bernard? He and a small force had arrived at the battle to offer support, but he obviously knew that picking the losing side again would be disastrous. He sat out the battle, waiting to see who won so that he could offer support. After the battle, he sent his son to Charles with pledges of loyalty and promises that he could talk Pepin II into giving up. He apparently had no intention of doing this, however, nor did his tepid support please Charles. While Charles marched on Aquitaine, he deprived Bernard of Toulouse, his only remaining territory. Bernard, refusing to accept this, allied himself with Pepin II. Events were not in Bernard's control, however. The Treaty of Verdun in 843 made an arrangement between the three brothers—Lothair, Louis the German, and Charles the Bald—to divide the empire. Pepin continued to make trouble in Aquitaine for many years. Bernard was captured a year later near Uzés in the south, where he had sent his wife years earlier when he became more involved in politics, and brought before Charles where his execution was arranged. A sad end for a man on the fringe of great events; if only he had been the recipient of good advice. For that, he would have had to spend more time with his wife; more on that tomorrow. *Historians consider this the same war that began in 837-8. After Louis the Pious dealt with an insurrection by his three sons (see yesterday's post), Bernard of Septimania was free to return from Barcelona, but any holdings that were given to him by Louis went to Berengar the Wise, the Count of Toulouse. The lands that gave Bernard the title Duke of Septimania were no longer in his possession. A mere two years after the first civil war, however, filial trouble reared its head again. Pepin of Aquitaine, still smarting from his treatment after rebelling a few years earlier, was summoned to his father's court, where he was treated so poorly that he departed without permission. Louis assumed Pepin would start trouble, and so he gathered an army to quell what he was certain was an imminent uprising. Louis declared the Aquitaine to be now the possession of Charles the Bald, his son by his second wife; the rest of his empire was promised to his eldest, Lothair. This move, however, did not satisfy Lothair. Not only was he bothered by seeing lands go to his half-brother, but he was also anxious that he not have to wait to rule it all. Lothair had a friend in the pope, Gregory IV (ruled 827-844), whom he had helped establish on the Throne of Peter—a slap to his father, since the choice of pope was supposed to be ratified by the emperor. * Lothair asked Gregory to join him and help reconcile the hostile posturing between father and son. 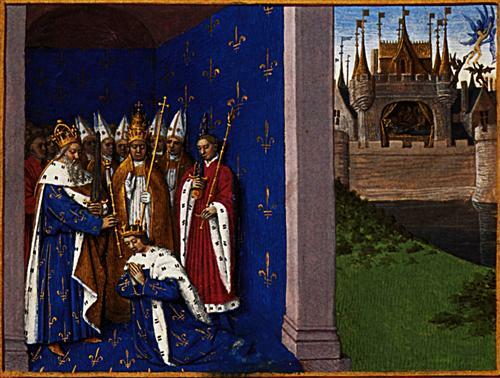 Pope Gregory joined Lothair, which annoyed the bishops who had sided with Louis. The conflict between the pope and bishops became as significant as that between the temporal lords, as they threatened to excommunicate each other. Gregory spoke to Louis, returned to Lothair to continue negotiations, and was prevented by Lothair of returning to Louis. The appearance this created was that the pope was supporting Lothair rather than peace, and Louis' troops began to desert him. Louis, his wife Judith, and son Charles were all sent to house arrest in different locations. In the formal procedure for deposing Louis and transferring all power to Lothair, however, the treatment of the one-time emperor was so demeaning that the nobles turned against Lothair. Louis returned to the throne in March 834, less than a year after his exile. Where was Bernard in all this? He and the dispossessed Pepin had remained loyal to Louis. After the return of Louis to his throne, Bernard requested the return of his lands. Louis was conflicted, because he didn't want to annoy Berengar. Fortunately, fate intervened: Louis summoned both men to his court in June 835, and Berengar died on the way. Bernard was free to take back his lands. Bernard had joined one civil war on the losing side, then one civil war on the losing side that turned out to be the winning side. There was a third option, however, and he would try it a few years later, in the free-for-all that followed the death of Louis. *There was a fuss made, and Gregory needed to wait to be ratified by Louis, but Lothair's actions still rankled. Yesterday's post about William of Gellone didn't mention his family at all, but he had four sons, Barnardo, Guitcario, Gaucelm, and Helmbruc. I want to talk about Barnardo, are as he is better known, Bernard. Bernard (795-844) was Duke of Septimania by heredity and Count of Barcelona by conquest (once his father took it from the Moors, as mentioned yesterday). He was one of the closest advisers to Charlemagne's son, the Emperor Louis the Pious, who ruled from 814-840. He would have been well-known to Louis' sons, and would have known them well in return—this will become very important a little later. Bernard seemed to make enemies when he was brought to court. The Emperor had sent his son Lothair to take up the Iron Crown of Lombardy in 829, and asked Bernard to take the position of chamberlain and watch over another son, Charles. Bernard asked his brother Gaucelm to handle his affairs in his absence. The choice to send Lothair away and give him a title was wise, because he was in frequent conflict with Louis' second wife Judith, who was trying to secure a realm for her son, Charles the Bald. Louis did give Charles something: Alemannia, which reduced the size of what Lothair would inherit from his father. Lothair accused Charles of illegitimacy—of being, in fact, the son of Judith and Bernard. Lothair held his temper in check, and it was another son, Pepin of Aquitaine, who would be the first to start a war.He gathered an army and marched toward Paris; he was joined by his younger brother, Louis the German. Their father came home from a campaign in Brittany to find his country in turmoil; he was surrounded by Pepin's forces and captured. Judith was imprisoned. Bernard fled to Barcelona. Lothair set out with an army to take control of the situation for his own ends. Louis, meanwhile, offered his two captors/sons a larger share of lands upon his death, so they freed him and swore loyalty to him again. This larger force now faced Lothair's army of Lombards; Lothair was forgiven his insurrection and sent to Italy for good. Pepin returned to Aquitaine. Judith was returned after swearing to her innocence. Bernard was exonerated. The civil war was over. A few years later, it would happen again. At the Metropolitan Museum of Art in New York City is an area called The Cloisters. Built in the 1930s, it incorporated elements of several medieval abbeys. Part of the Cloisters comes from the abbey of Saint-Guilhem-le-Désert, whose founder is the subject of today's post. William of Gellone (755-814) was a cousin of Charlemagne's and the second count of Toulouse. 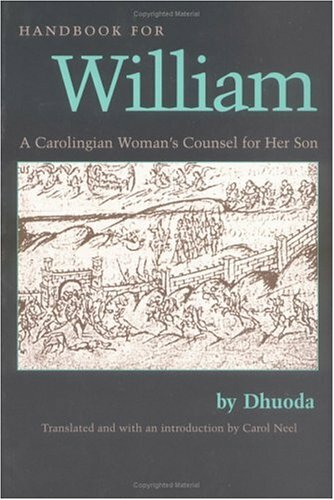 When Hisham I of Cordoba declared a holy war against the Christians in southern France in 793, William was asked to respond to the threat. William met Hisham's army; he was unable to defeat them, but resisted so strongly that he wore down the invading Moors by attrition and they gave up their attempt to conquer southern France. Some years later, William was part of a large force that re-captured Barcelona. His military exploits are celebrated in literature and legend. In 804 he founded a monastery in the valley of Gellone. Later named Saint-Guilhem after him, a village of the same name developed around it. 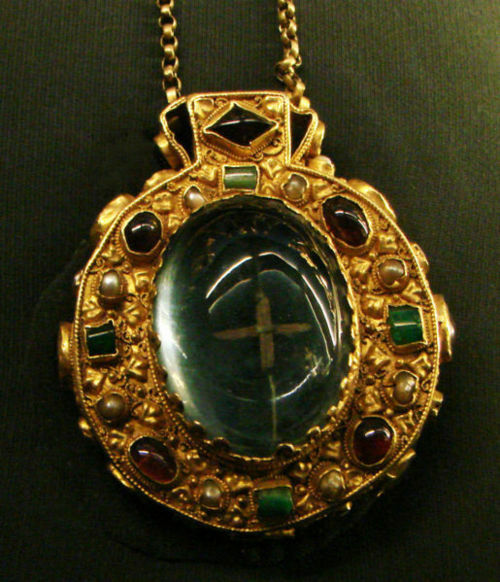 He donated to the abbey a piece of the True Cross that had been a gift to him from Charlemagne. The location of the abbey and its possession of such an important relic made it a popular stopping place on the pilgrimage to Santiago de Compostela. Two years later, William himself became a monk there. He became well-known as the abbey's benefactor and a pious man; supposedly, upon his death the church bells rang without anyone touching them. His will left even more to the monastery. His legend grew so much that his body was eventually transferred to a spot in the abbey church where it could be seen better. It was during the French Revolution that the abbey started to suffer; much of it was dismantled. Thanks to the interest and financing of John D. Rockefeller, part of the structures found a new home overlooking the Hudson River in New York. What makes a pope into an antipope? In 355, the Roman Emperor Constantius II (317-361) wasn't happy with the pope. Constantius was an Arian Christian, and he did not care for the Council of Nicaea's decision to outlaw Arianism. Since St. Athanasius of Alexandria was instrumental in that decision, Constantius wanted Pope Liberius (ruled 352-366) to condemn Athanasius. Liberius refused to do so, and the Emperor sent him into exile in Thrace. In his place, the Emperor installed Pope Felix II. The politics of papal succession were far more flexible then. It wasn't until Celestine V that formal voting by the body of cardinals began to be the expected method. 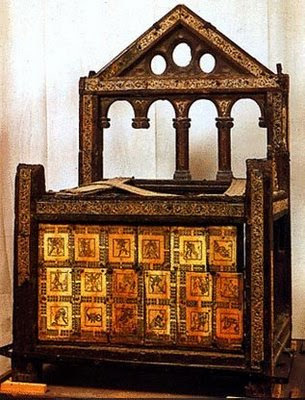 So temporal rulers often put their favorites on the Throne of St. Peter. Little is known of what Felix accomplished. Records from the 4th century are scarce, and his name was later confused with St. Felix. After two years, the people of Rome begged Constantius to bring back Liberius; it took another year for him to return. Felix was still present, and Constantius wanted the two to rule jointly, but the people of Rome objected and drove Felix out. Tradition says he was forced to retire to Porto, near Rome, where he died on 22 November 365.
we come across elections in which problems of harmonising historical criteria and those of theology and canon law make it impossible to decide clearly which side possessed the legitimacy whose factual existence guarantees the unbroken lawful succession of the successors of Saint Peter. The uncertainty that in some cases results has made it advisable to abandon the assignation of successive numbers in the list of the popes. Pope Celestine V might have needed Cardinal Benedetto Gaetani to find a justification for him to resign, but papal resignations had taken place previously. The 11th century saw two papal resignations that might have saved a little time in the 13th century, had they been remembered. One of them was largely a political pawn—albeit probably a willing one. Phasanius became pope in January 1004, taking the name John XVIII. * Like several decades of popes prior to him, he owed familial allegiance to the head of the Crescentii clan, a patrician Roman family who wielded great power in Rome, controlling much of the City as well as the popes. Unlike Celestine V, John XVIII was an administrator, and the records of his papacy show that he worked at various initiatives: he established a base, the See of Bamberg, from which to begin christianizing the Slavs to please King Henry II of Germany. He confirmed archbishops, including Elphege of Canterbury. He arbitrated disputes between religious figures. Even in Constantinople he gained Eastern Orthodox recognition as the Bishop of Rome; it is assumed he somehow reached out to the Eastern Church and established (however briefly) some kind of détente. Details of his departure from the Throne of Peter are missing. A catalog of popes lists him as having been a monk at St. Paul's near Rome at his death in June 1009. At some point he must have stepped down; perhaps he wasn't doing enough for John Crescentius III, the had of the Crescentii clan. He was replaced by Pietro Martino Buccaporci (Peter Martin Pigsnout), who was no doubt glad to take the name Pope Sergius IV. Sergius and John Crescentius both died in the spring of 1012, and the Crescentii influnce over the papacy faded away. It can be said that he left the papacy several times, some of them of his own volition. He was driven from Rome in 1036, but returned with the help of Emperor Conrad II. He was driven out again in 1044 and Pope Sylvester III was elected, but Benedict returned again in April 1045 and drove out Sylvester (who never stopped calling himself pope). In May 1045, Benedict resigned in order to get married; he sold the papacy to his godfather, Fr. John Gratian, who took the papal name Gregory VI. He changed his mind, however, and returned to Rome months later, taking back the throne by force until July 1046. For most residents of Rome, however, Gregory VI was the true pope now. It did not help when Sylvester III pushed his own previous claim forward. King Henry III of Germany intervened, and at the Council of Sutri in December 1046, it as decided that all three popes were to be replaced. A bishop from Germany named Suidger became Pope Clement II. Clement died less than a year later, however, and Benedict tried to seize power again but was driven away by German troops. Poppo of Brixen was elected Pope Damasus II, and things finally started to settle down. *Note: although he was the 18th pope to take the name John, he is officially considered the 17th John, because John XVI (pope from 997-998) has been declared an antipope and does not count in the true reckoning of popes. The historical numbers taken by the popes has never been "corrected." Yesterday referred to the resignation of Pope Celestine V, and that there was some confusion about it. It was not common for popes to resign, but it did happen. Celestine V (1215-1296) was born Pietro Angelerio to a family of humble farmers. His mother wanted better for him; it may be through her urging that he joined a Benedictine monastery in 1232. After several years, he chose the life of an ascetic, and lived in a succession of caves, including one at Monte Morone, because of which he was sometimes called Pietro di Morone. His penitential activities were severe: he wore a chain of iron, fasted every day except Sunday, spent four Lents each year while living on bread and water, and prayed continuously. As we have seen previously, such holy men draw others to them, and soon Pietro had a following who wished to live by his example. This following became a sub-order of the Benedictines, and were called the Celestines. He seemed content to live an exemplary life for other devout ascetics. A deadlocked committee of cardinals spent two years and three months after the death of Pope Nicholas IV, unable to agree on a candidate, until Cardinal Latino Orsini (d.1294) proclaimed that a good and saintly man would come to Rome and admonish them if they did not come to agreement. Supposedly, they all knew to whom he referred: the hermit of the Morone. King Charles of Naples liked the idea that one of his subjects would become pope. Thousands of members of spiritual orders believed this was the best election in centuries. He was crowned August 1294 as Celestine V (note that he was almost 80 years of age), and quickly showed that he was not going to be a good pope. He had no organizational skills, and no memory (he would give the same benefice to more than one person). He would appoint bishops and cardinals without observing proper protocols. He quickly created many cardinals, the majority of them French; this would help lead to the Avignon papacy which led to the Great Schism. He tried to make the cardinals adhere to a strict schedule of prayer, and wanted to give away papal treasure to the poor. He wasn't exactly enjoying the life. Administrative matters began to press on him, which left him no time for his devotions. Resigning the position seemed like a good idea, but could it be done? Were popes eligible for resignation? Cardinal Benedetto Gaetani advised that common sense and the need to preserve the church allowed for resignation when the pope was incapable of performing the job. The aged pope summoned his cardinals and resigned after only five months and eight days, leaving to them the task of finding his replacement. Within two weeks, they had one: Benedetto Gaetani—who had provided the argument allowing Celestine to resign—would become Pope Boniface VIII. His first acts were to revoke many of the decrees of his predecessor. He also took Celestine into custody, lest the old man become a tool for some unscrupulous person who might challenge the change in pontiff. He imprisoned Celestine for the remainder of his life. To us this seems cruel, but for the reluctant pope it meant a return to the solitary life he had enjoyed for decades, left with silence and the time to pray. He died 13 December, 1294. When Pope Boniface VIII wasn't excommunicating people for treating corpses in unapproved ways, he was very busy doing lots of other things. Benedetto Gaetani was born about 1235 in Italy. A younger son of minor nobility, his religious career began when he was sent to a monastery. He became secretary to a cardinal in 1264, which put him close to Vatican politics. He had a busy career in international affairs, accompanying a cardinal to England to put down a rebellion, going to France to supervise a collection, and acting as a diplomat to France, Naples, Sicily and Aragon. In December of 1294, stating "the desire for humility, for a purer life, for a stainless conscience, the deficiencies of his own physical strength, his ignorance, the perverseness of the people, his longing for the tranquility of his former life," Pope Celestine V resigned. A contemporary said that it was Benedetto Gaetani who convinced him to resign; other reports say that he was only one of several, or that Gaetani was the person who convinced Celestine that a papal resignation was legal. Whatever the case, Benedetto Gaetani was elected pope by the conclave on Christmas Eve. That's when the fun began. His first act was to imprison his predecessor. A few years later he formalized the Roman Jubilee, a tradition that established a year of pilgrimages to Rome for pardoning of sins. This influx of tourists seeking forgiveness turned into a big money-maker for the pontiff. This may be why Dante put Boniface into the 8th circle of Hell in Inferno, with the simonists. He enriched the lives of his relatives, and used his position to war against the Colonna family (rivals of the Gaetani); he even offered a pardon for one's sins equivalent to that granted when one goes on Crusade if you would join in his war against the Colonna. He was the epitome of a power-mad ruler. ...and that has been the source of endless conflict between the papacy and others ever since. As attractive as astrology was in the Middle Ages, not everyone was willing to accept the premise that it was "easy" to use it for predictive purposes, or even that it was likely that the existence and movements of observable heavenly bodies had a direct influence on events and people on Earth. We have seen how some sources, such as the University of Paris, spoke against astrology's predictive uses not because it believed they were in error, but because they were believed to contravene God's wishes for human beings. There were others who objected to the reliance on astrology because they could not believe that it was likely to work. And if you astrologers answer that it is precisely because of this distance and smallness that their influences are negligible, then why is it that you claim a great influence for the smallest heavenly body, Mercury? Why is it that you have given an influence to al-Ra's and al-Dhanab, which are two imaginary points? Astrologers accepted at the time, through their calculations, that the stars appeared small because they were far away, but were actually enormous compared to the world. They also knew that the Milky Way was "a myriad of tiny stars packed together in the sphere of the fixed stars"; Al-Jawziyya said that it was impossible to know what effect, if any, they would have. Astrology had too many variables, and was just so much guesswork. What were the "two imaginary points" mentioned in the above quotation? He was referring to "orbital nodes," the imaginary point in space where the line of "an orbit crosses the plane of reference to which it is inclined." Astrologers made much out of these points, which had no physical existence, and yet ignored actual physical stars. They neglected stars as being too small to matter, and yet put all their attention on planets that were a ridiculously small fraction of the size of a star. 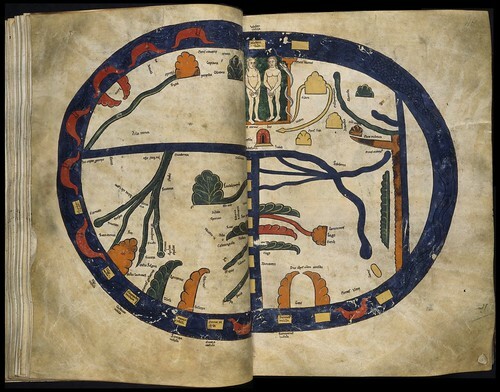 To the keen legal and theological mind of Al-Jawziyya, this suggested that astrology was not, in fact, based on any kind of rational thinking. Albertus Magnus, Robert Grosseteste, Geoffrey Chaucer—well-known names from the Middle Ages denoting a Dominican scientist, a university scholar and administrator, and a courtier and poet. One thing they had in common, besides a love of learning, was their attention to the art of astrology. And through their interest in astrology, they were all influenced by a 9th century Arab known in the West as Albumasar. His full name was Abu Ma'shar Ja'far ibn Muhammad ibn 'Umar al-Balkhi (787-886), and he was one of the most respected figures in the history of astrology. Abu Ma'shar was of particular interest to Western Europe because he was a source for knowledge of and commentary on Aristotle when his writings reached Europe in the 12th century, brought back by the Crusaders. He offered so much more, however. His work blends knowledge of Greek science with Islamic doctrine, Persian chronology, Mesopotamian astrology, and hermetic traditions from Anatolia. He presented a unified approach to the knowledge of several cultures that lent weight to his work. For instance, he uses the Biblical Flood as the focal point of his astrological tables. He calculates it at midnight on Thursday to Friday, 17-18 February 3101 BC. This date was not arbitrary, nor was it an indication that Abu Ma'shar believed in a short-lived Earth. He chooses the date because it is the start of the Hindu Kali Yuga (the "age of vice"; the last of four phases the world will go through). His knowledge and acceptance of Hindu chronology and its "Great Year" (composed of 360,000 years) is further shown when he calculated a grand conjunction of planets in 183,101 BC, and again in 176,899 BCE. The Middle Ages loved "unified theories" that could reconcile different traditions to enhance understanding. Abu Ma'shar argued for the superiority of his chronological calculations because he made the year out to be 365.259 days long. Why was he so enamored of this number? Because "259" he explained was the minimum number of days for human gestation (8.6 months). It was obvious to him that he was onto something! 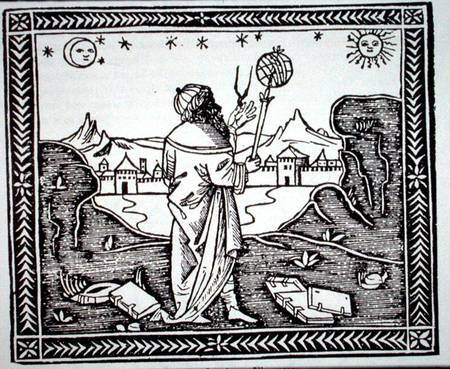 Unlike the hostility experienced by astrology from the University of Paris and others, who felt it was a way to contravene God's plan, or to know what should remain unknowable, Abu Ma'shar was able to give his astrology a veneer of respectability by acknowledging Islamic religious doctrine. Since the last two days have been about reconciling opposing views, and since today is the anniversary of the death of Albertus Magnus, it would probably be a good time to talk more about him. Albertus Magnus (c.1200-1280) has only been mentioned so far in the context of rainbows, but he was involved in so much more than that. A German Dominican who became provincial of the order in 1254, he became so widely known for his learning that the term Magnus (The Great) was attached to his name in his lifetime by contemporaries such as Roger Bacon (also mentioned in the rainbow entries, as well as here). Although in the future the Dominicans would be nicknamed Domini canes (dogs of the Lord) and be put in charge of rooting out heresy, Albertus would actually spend part of his life writing to defend ideas that were considered heretical. 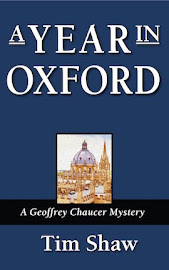 Most of the charges of heresy were coming from the University of Paris. The University issued a series of Condemnations between 1210 and 1277, condemning the teaching of ideas they considered heretical. Paris had no authority to universally condemn these teachings, however. In a twist that might seem very modern, this left other universities open to excellent marketing opportunities. The University of Toulouse invited students with "Those who wish to scrutinize the bosom of nature to the inmost can hear the books of Aristotle which were forbidden at Paris." Attacking Aristotle was one way to raise the ire of Albertus. He had written commentaries on all available works of Aristotle, bringing that classical author more fully into the realm of accessible discussion. When Paris condemned the teaching of Aristotelian astrology as a threat to the notion of free will, Albertus had to get involved by writing the Speculum astronomiæ (Mirror on astronomy). * In this work, Albertus explains (using Aristotle's model of the heavens, of course), how the study of astrology and its predictive ability does not contravene God's Will or Free Will. Between God's divine Will and human beings are the nine spheres of the heavens. As God's Will passes through each of the celestial and planetary spheres, it is tainted by exposure to those un-divine substances, just as water flowing down a stream can erode the banks and pick up silt. This has two results. One is that what we perceive in our study of astrology here from Earth is altered, meaning we are not looking directly at and anticipating God's intent for us. The other result is that, because the divine influence has been tainted or diluted by exposure to corporeal bodies, its influence is now corporeal; that is, it may affect our bodies, but not our souls. Astrological influence could make a man envious or prideful or lustful, and many people are content to just follow their impulses, but we have the ability to refuse to act on these impulses. For Albertus, studying astrology helped to forewarn us about the influences that filtered down through the heavens, and gave us a chance to resist them. The Speculum became a central argument in favor of astrology for centuries, claiming that astrology helped us to understand and perfect our use of Free Will. *There are numerous medieval works ascribed to Albertus Magnus with little proof, so modern scholars are cautious about claiming authorship; the Speculum has been disputed, but recent scholarship has found sufficient evidence to feel comfortable to claim it was by Albertus. William of Conches (1085-1154), as mentioned yesterday, wrote on Plato's Timaeus. The Timaeus was a popular work or analysis because, for a long time in the Middle Ages, it was the only work of Plato accessible to scholars. Medieval scholars, looking to create a "unified theory" of the world, did not want to reject material from the venerated philosophers of the past—even if they were pagan. Instead, they tried to reconcile earlier writers to Christianity to make a complete picture. Natural Philosophy—the attempt to explain how the world works—had its own goal of reconciliation: to explain how a world where choice was possible could co-exist with a God who oversaw and was the motivator of everything that happened. There is an idea that science and religion find themselves in conflict because determining physical causes is pointless in a world where God determines everything. The classic example of this is: what should a good Christian do if he becomes ill? Should he visit a priest or a doctor? Is illness a divine punishment for sin, or best understood as a physical failing that can be treated? In the Middle Ages, of course, the sufferer would not take chances, and would visit both. But men like William of Conches wanted to bring these two sides intellectually into agreement. He recognized that God was the ultimate cause: His omnipotence made him the primary cause that underlies everything in the universe. As a natural philosopher, however, William drew a distinction between this aspect of God and His methods for achieving His aims. There are actions, he said, that are secondary causes. For instance, if I put a kettle with water on the stove to make tea and turn on the flame, my actions will cause the water to boil. A natural philosopher can examine the boiling water, measure its temperature, gauge the length of time it takes to boil and how active the boiling is, and find uses for boiling water. Those are all secondary causes and effects, however; the primary cause is my desire to make tea and my application of heat. The natural philosopher can learn about heat and water without knowing about my desire for tea. If he observes the water heating several times, he will learn to predict the outcome through his understanding of natural law. What about miracles? Well, a miracle is an event that we recognize happens that contravenes natural law; in order to recognize a miracle, however, William said we first need to thoroughly understand natural law. By analyzing natural laws, the philosopher does not challenge God's authority; he is analyzing the secondary causes, with the understanding that they are an "additional layer" between God and the world. Given that miracles are possible, however, does this invalidate our observations of natural law and are reliance on our predictive ability regarding them? For his part, William was very clear: he believed that God was loving and consistent, rather than capricious. The natural laws that God established would remain natural laws forever. The few times we observe something different are either a miracle—an anomaly that we do not have to understand, or merely more information that will enhance our understanding of natural law. In 1620, Sir Francis Bacon published Novum Organum ("The New Organon," by which he meant a new interpretation of nature). In it, he claimed that the ancient fathers of the Christian church did not tolerate a belief in a round Earth. It is probably this work that influenced the popular belief ever since that the Middle Ages, or religion, were steadfast in their belief in a flat Earth. There is plenty of evidence to the contrary, however. True, there was "evidence" in the Middle Ages of a flat Earth. The Mappa Mundi (Map of the World), meant to portray the part of the world believed to be habitable, does make the world look flat and finite. Way back in he 3rd century BCE, however, Eratosthenes had coined the term "geography" and measured the circumference of the clearly round Earth by noting the difference in shadows of a stick at noon on two points many miles apart; the angles and length of the shadows told him that the sun was shining down on the surface at different angles, and the surface was therefore curved. It is well known and you have seen it demonstrated by astronomers, that beside the extent of the heavens, the circumference of the earth has the size of a point; that is to say, compared to the magnitude of the celestial sphere, it may be thought of as having no extent at all. As learning spread—specially with the advent of mass printing—perceptions of the Earth's shape would have spread thanks to re-printed classical works. Columbus' idea to go west to arrive at an eastward point was not a risky gamble or a brilliant insight. Other "facts" in the Bible were also understood to be not literal: Pope Innocent III, for instance, knew that the Moon shone with reflected light, even though the Bible refers to the Sun and Moon as "two lights." It is very likely that Bacon and the rest of Europe's scientific community was aware of this growing conflict. In this historical context, Bacon's statement can be seen as a condemnation of the Church because of a recent action—even though for centuries the knowledge of a round Earth was common. *In fact, the original figure might have been more accurate than we suspect: it was given in Greek stadia, a measurement which meant different things to different users. Our best interpretation is 29,000 miles, but if Pliny were using stadia of a slightly shorter length... .
Let's sum up: when the White Ship sank, taking the heir of King Henry I with it, he finally settled on Empress Matilda (Henry's daughter) as his next heir. When Henry died, however, Stephen of Blois (Henry's nephew) rushed to England and seized the throne with the help of many of the nobles. Thus began a civil war called "The Anarchy" during which the citizens suffered much by the actions of their king and the greed and overreaching of his nobles—so much so that "Christ and his saints wept." After the exchange of prisoners (mentioned in Part 2)—Robert of Gloucester for King Stephen—the war between Stephen and Matilda went back and forth with no one in control of the whole country. Matilda's husband, Geoffrey of Anjou, was busy gaining and holding the King of England's provinces on the continent while Matilda ran her military campaigns in England. In 1147, Matilda brought her and Geoffrey's eldest son, Henry, on another unsuccessful invasion of England. 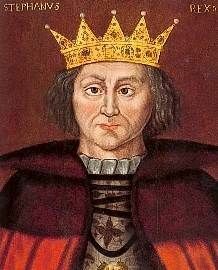 Although Henry was only 14, he became convinced and determined that his mother should be recognized as queen. Henry was an impressive youth. His great-uncle, King David I of Scotland, knighted him in 1149. His father made him Duke of Normandy a year later, when he was still only 17. Shortly after that, he made one of the most famous marriages in the Middle Ages, when he wed the powerful Eleanor of Aquitaine (who was about 10 years older than Henry) after she left her husband, King Louis VII of France, and brought the province of the Aquitaine with her. Meanwhile, Stephen was dealing with a restless populace, nobles who were amassing their own power during his weakness and building castles with which to form centers of power, and difficulties with the Church. English lands once owned by the Church were promised by Stephen to return to them, but nobles had seized many of them, and Stephen had no power to make his nobles relinquish the territories. When Archbishop of Canterbury William de Corbeil died, Stephen seized his personal wealth, an action which was not well received by the clergy. grieved beyond measure by the death of the son who he hoped would succeed him; he pursued warlike preparations less vigorously, and listened more patiently than usual to the voices of those urging peace. Actually, a treaty had already been broached earlier that summer, but Eustace had opposed it. Now, with Eustace no longer providing opposition and the future of Stephen's dynasty insecure, the Treaty of Wallingford was re-visited. It was made formal and ratified in November. The agreement was that Stephen would remain on the throne until his death (which came just a year later, in October 1154), after which Matilda's son would take the crown as Henry II. Henry was crowned on 19 December, 1154. His 35-year reign would have its ups and downs, but he would be recognized as a great king. As for the Empress who would be Queen: she retired to Rouen. She died in 1167 and was buried at the Abbey of Bec-Hellouin in Normandy. Her body was later re-interred at Rouen Cathedral, where her epitaph reads: Great by Birth, Greater by Marriage, Greatest in her Offspring: Here lies Matilda, the daughter, wife, and mother of Henry. Before we conclude our three-part journey through the 20 years of civil war between Stephen of Blois (a usurper whom history calls king) and the Empress Matilda (an acknowledged heir whom history calls a footnote), I wanted to pause and look at what the country itself thought about the dispute. Clearly, among the nobles, there were those who chose to offer their loyalty to one or the other, based on personal preference or the potential opportunities for advancement gained if their chosen leader won the throne. In any war, however, the greatest suffering is felt by those who are not in charge, so how did the average citizenry fare? What did contemporary chroniclers think of the events of the 20 years that Stephen and Matilda spent fighting each other? We have an answer in the Anglo-Saxon Chronicle, which records events (and opinions on them) in England from the birth of Christ until the end of the reign of Stephen of Blois. It turns out that Stephen had his detractors. In the days of this King there was nothing but strife, evil and robbery, for quickly the great men who were traitors rose against him. When the traitors saw that Stephen was a mild good humoured man who inflicted no punishment, then they commited all manner of horrible crimes. they had done him homage and sworn oaths of fealty to him, but not one of their oaths was kept. They were all forsworn and their oaths broken. For every great man built him castles and held them against the king; they sorely burdened the unhappy people of the country with forced labour on the castles; and when the castles were built they filled them with devils and wicked men. By night and by day they seized those they believed to have any wealth, whether they were men or women; and in order to get their gold or silver, they put them into prison and tortured them with unspeakable tortures, for never were martyrs tortured as they were. They hung them up by the feet and smoked them with foul smoke. They strung them up by the thumbs, or by the head, and hung coats of mail on their feet. They tied knotted cords round their heads and twisted it until it entered the brain. they put them in dungeons wherein were adders and snakes and toads and so destroyed them. Many thousands they starved to death. I know not how to, nor am I able to tell of, all the atrocities nor all the cruelties which they wrought upon the unhappy people of this country. It lasted throughout the nineteen years that Stephen was king, and always grew worse and worse. Never did a country endure greater misery, and never did the heathen act more vilely than they did. And so it lasted for nineteen long years while Stephen was King, till the land was all undone and darkened with such deeds and men said openly that Christ and his saints slept. Tomorrow we will conclude the tale of the period in England called "The Anarchy" and see how Matilda's son becomes the next king. In 1135, upon the death of Henry I of England, his nephew Stephen of Blois (c.1192-1154) assumed the throne. All well and good, except that Stephen (and the top men of the country) had sworn an oath years earlier to uphold Henry's choice of his daughter Matilda as heir. Stephen's argument was that his oaths were not as important as a quick and successful transition. His opportunity came because Matilda was across the Channel and Stephen was able to travel faster than she—also, he was supported by many of the barons and Stephen's powerful younger brother, Bishop of Winchester Henry of Blois. 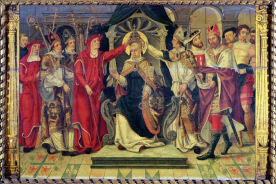 Stephen was crowned on 26 December. Shortly after, he had to go north to deal with Scotland. David I of Scotland (1084-1153) was laying claim to lands in the north of England, and Stephen dealt with this quickly and decisively. His court at Easter was lavish and well attended by the nobles of England. Stephen's position had been confirmed by Pope Innocent II. Later conflicts with Wales turned to victories for Stephen. All looked well. Meanwhile, on the continent, Matilda and her husband, Geoffrey of Anjou, were taking control of the lands that had been joined to England since William the Conqueror—the mutual grandfather to many of the players in this drama. By 1144, Geoffrey and Matilda were styling themselves Duke and Duchess of Normandy. By 1139, she had gathered sufficient armed forces in France to be able to cross the English Channel and begin the conquest of southwest England. In February 1141, Stephen's forces besieged Matilda in Lincoln Castle; unfortunately, Matilda's illegitimate half-brother, Robert, 1st Earl of Gloucester, brought up his forces behind the king. Robert was aided by the Stephen-hating Welsh. Many of Stephen's forces deserted him, and the king was captured and imprisoned in Bristol, a city currently in the hands of Matilda's forces. Matilda made a procession to London, sending word ahead that the "Lady of the English" (so she was calling herself) was coming to be made Queen, as was her right. Once she took up residence, emissaries from the city suggested what was probably her surest way to gain their hearts: cut their taxes in half. When she refused to do so, the citizens waited until she had left the city, and then shut the gates of London against her. Meanwhile, the imprisoned Stephen's wife, also named Matilda, succeeded in capturing Robert of Gloucester, and used him to arrange an exchange of prisoners. With the release of both Stephen of Blois and Robert, hostilities resumed. 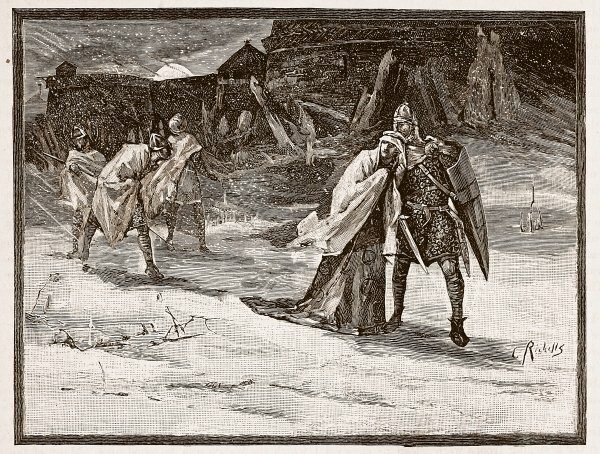 The following winter, Queen Matilda was almost captured at Oxford, but she fled across the frozen Thames, camouflaged against the snow in a white cloak. The future of England's throne was looking more uncertain than ever. When the White Ship sank in 1120, drowning King Henry I's son and heir, William Adelin, England was in crisis. 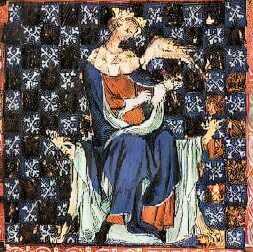 Henry decided that his daughter, Empress Matilda (1102-1167), should inherit the throne. She was called "Empress" because she had been betrothed as a child to the Holy Roman Emperor, Henry V; they were married in 1114. She had actually spent some years as Henry's regent in Italy, gaining some political and administrative experience. That came later, however. Her father, King Henry I, had about 20 illegitimate children, but none of them would have been acceptable as king, so he tried to gain himself a legitimate heir to replace William by marrying again in 1121 (to Adeliza of Louvain), but no male heir was forthcoming. Henry V died in 1125, and Henry I summoned his daughter from Germany—awkward for her, since she had essentially become a German, having grown up there since childhood, learned the language, and ruled its people. Still, she had not produced an heir for Henry V, and so that dynasty ended and the throne went to someone who had no use for the widow of his predecessor. Matilda spent a year in Normandy, becoming re-acquainted with her father, and in 1126 went to England. Even though Henry had his Court swear oaths to accept her status, however, not everyone was pleased with the choice. King Louis VI of France suggested William Clito, Henry's eldest illegitimate son, in order to create conflict in the English court. Through a sudden and advantageous marriage, Louis managed to make Clito's status more important and potentially more disruptive to Henry's plans. Then, in 1135, Henry I died. Matilda was in Anjou with her new husband, Geoffrey of Anjou—too far from England to take control of the situation. Her cousin, Stephen of Blois, rushed to seize the Crown, breaking—along with a majority of barons—the oath he had sworn years earlier. His action started a period of civil war that lasted for almost 20 years. Thereupon, returning to the monastery, he obtained the companionship of another friar, of equally determined spirit, and two powerful young men, with whom he intended with constant vigilance to keep guard over the cemetery where that miserable priest lay buried. These four, therefore, furnished with arms and animated with courage, passed the night in that place, safe in the assistance which each afforded to the other. Midnight had now passed by, and no monster appeared; upon which it came to pass that three of the party, leaving him only who had sought their company on the spot, departed into the nearest house, for the purpose, as they averred, of warming themselves, for the night was cold. As soon as this man was left alone in this place, the devil, imagining that he had found the right moment for breaking his courage, incontinently roused up his own chosen vessel, who appeared to have reposed longer than usual. Having beheld this from afar, he grew stiff with terror by reason of his being alone; but soon recovering his courage, and no place of refuge being at hand, he valiantly withstood the onset of the fiend, who came rushing upon him with a terrible noise, and he struck the axe which he wielded in his hand deep into his body. On receiving this wound, the monster groaned aloud, and turning his back, fled with a rapidity not at all in[f]erior to that with which he had advanced, while the admirable man urged his flying foe from behind, and compelled him to seek his own tomb again; which opening of its own accord, and receiving its guest from the advance of the pursuer, immediately appeared to close again with the same facility. 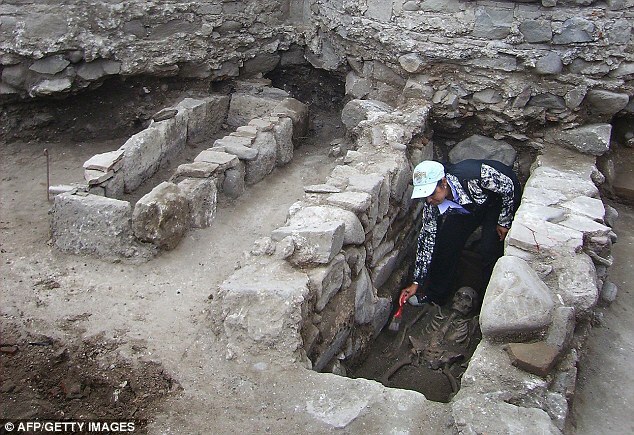 In the meantime, they who, impatient of the coldness of the night, had retreated to the fire ran up, though somewhat too late, and, having heard what had happened, rendered needful assistance in digging up and removing from the midst of the tomb the accursed corpse at the earliest dawn. When they had divested it of the clay cast forth with it, they found the huge wound it had received, and a great quantity of gore which had flowed from it in the sepulchre; and so having carried it away beyond the walls of the monastery and burnt it, they scattered the ashes to the winds. These things I have explained in a simple narration, as I myself heard them recounted by religious men. On this, the 165th anniversary of the birth of Bram Stoker, whose Dracula brought the concept to the modern era, I thought a story of a man so sinful that his evil lives on after his death would be appropriate.